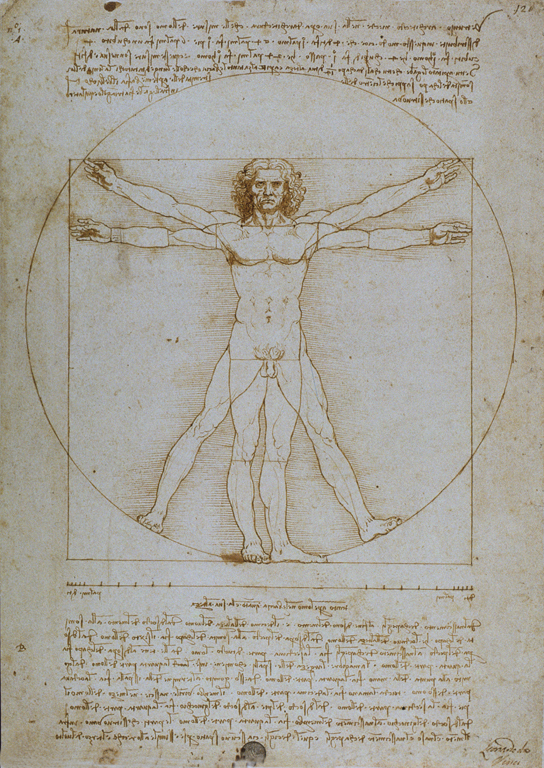 This iconic drawing illustrates Leonardo’s own interpretation of Vitruvius’ written account of how the ideal proportions of man, with arms and legs outstretched, would fit into the geometric forms of the square and the circle. (The navel falls in the center point of the circle). In this drawing, he corrected inconsistencies in Vitruvius’ measurements of the human figure, guided by his own observations and deductions based on the study of life models. 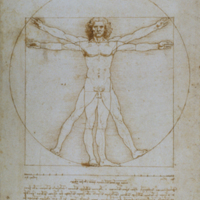 Leonardo da Vinci (Italian artist, 1452-1519), “Vitruvian Man,” Institute Images Online, accessed April 24, 2019, http://westerncivart.com/items/show/2946.